Thanks in large part to the special effects genius of Ray Harryhausen, Earth vs. the Flying Saucers has become a Sci-Fi classic. In the film, Operation Skyhook, has been sending rockets into the upper atmosphere to probe for future space flights only to have them all disappear. During the final rocket launching, a UFO lands and the military shoots at it, triggering the destruction of the installation and a cryptic warning from the aliens. In response, scientists develop an anti-magnetic beam weapon to disable the flying discs. Needless to say - we won. 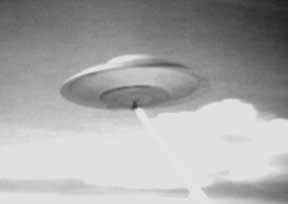 Seen in the movie are two scenes using stock film footage showing flying saucers "destroying" military aircraft. One shot is of a WWII B-17. The other is a bit of a mystery, and we would like to find out more. 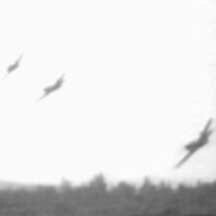 It shows three aircraft coming in low. 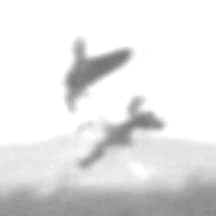 Two of the aircraft collide (in the film, a beam from the saucer is to blame) and impact the ground in a flaming crash. See it via YouTube - click the image on the left! Now the mystery - where, and when did the real crash occur? What are the aircraft involved (P-36?). Since the movie was released in 1956, the crash had to of occurred that year or earlier. 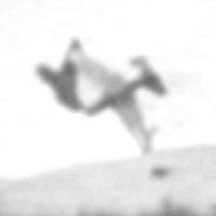 This mid-air collision occurred near Spokane, Washington, on the afternoon of July 23rd, 1944. Three Curtiss RA-25A "Shrike" aircraft (the Army's version of the naval "Helldiver") were in formation, and the two in the center and left collided. Aircraft from throughout the Army Air Forces were slated to fly during an airshow, sponsored by the Spokane Air Service Command, at a natural amphitheater north of Baxter General Hospital, an event with an estimated one hundred thousand onlookers in attendance, as well as a newsreel crew from Paramount. The airplanes had been circling in an area to the north of Spokane waiting for their turn to fly past the crowd. After a flight of two Douglas A-24 "Dauntless" aircraft overflew the area, the formation of A-25s started to make their approach but still had not received permission to overfly the amphitheater. The flight of three made an S-turned and lengthened their flight path until they received approval. The three Shrikes then made a left diving turn and then a right diving turn toward the spectators. 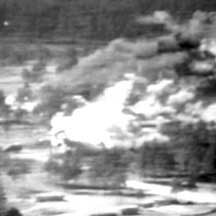 The left most aircraft turned into the center aircraft on the right turn, forcing both aircraft down into the valley below, spraying fuel and burning metal. Pilot 2Lt George E. Chrep and engineer-rated passenger Sgt. Joseph M. Revinskas were killed in the crash of RA-25A # 42-79804; pilot 2Lt William R. Scott and passenger Captain Ford K. Sayre, a noted snow skier on the east coast, were killed in the crash of RA-25A # 42-79826. 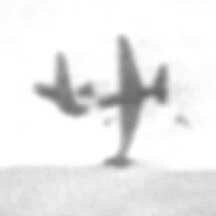 The footage was shot by the Paramount Pictures Newsreel crew and can be seen on a documentary titled "The Spectacle of Flight," as well as black & white stock footage in several movies. Stills from the newsreel feature heavily in the official mishap report. This mystery was finally solved correctly by Anthony Mireles, of Illinois... Thanks a million, Anthony! An inspired reader of the website, Darcy Hildebrand, has attempted to locate the precise location of this crash. Click here to read the exciting and informative tale of his quest! If you have any additional information or thoughts,- we'd love to hear from you.